Full disclaimer on “Godzilla vs. MechaGodzilla II” – This is my ultimate guilty pleasure Godzilla movie. This isn’t a particularly well-made Godzilla film, and is more-or-less just a dumb popcorn flick that exemplifies how repetitive the Heisei series could be. But goddamn, I love this movie! Honestly, there’s a lot to love about it. The soundtrack by Akira Ifukube is one of the best he did since the 1960s Godzilla films. Every monster scene feels unique and carries enough weight that it makes every fight feel substantial, not to mention every monster gets a good chance to shine. The plot, while simple, does its job at creating one of the better “Man vs. Godzilla” films of the Heisei series. But what really gets me with “Godzilla vs. MechaGodzilla II” is its ending, and we will get to that later. 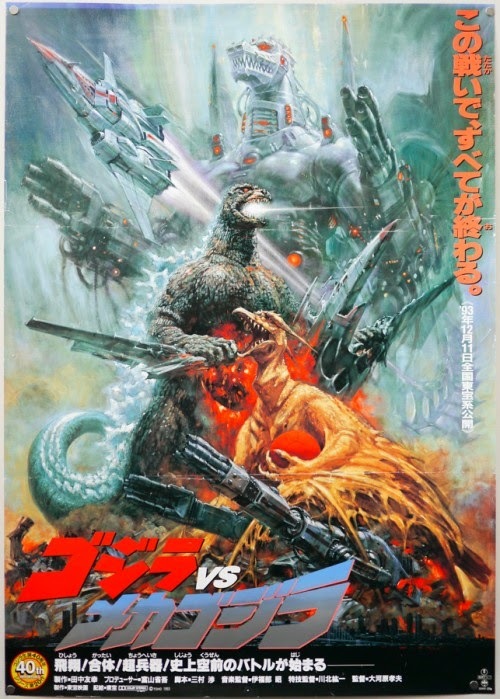 I should note this isn’t a direct sequel to 1974’s “Godzilla vs. MechaGodzilla” (though that film did have a direct sequel that I’ll talk about later). This film takes place in the middle of the Heisei series, right after “Godzilla and Mothra: The Battle for Earth” but before “Godzilla vs. Space Godzilla.” There aren’t many films out there that have the number two in the title but are not sequels, and this is one of them. The G-Force salvaged what they could from Mecha-King Ghidorah and started reverse-engineering its armor and technology, which is pretty big considering it’s made up of tech from the 23rd century. The G-Force then set out to use this knowledge and power to create their next big project – MechaGodzilla. The film spends the next little while talking about how badass MechaGodzilla is, describing how they basically took the weapons the Heisei series has built up to this point and put it in MechaGodzilla. It has Mecha-King Ghidorah’s armor and schematics, missiles that can paralyze Godzilla like the first Super-X did in “Return of Godzilla,” and it even has an upgraded version of the Super-X2’s fire mirror, able to absorb Godzilla’s atomic ray to power its ultimate weapon, the Plasma Grenade. Now the only thing missing for this operation are MechaGodzilla’s pilots. The G-Force basically makes an entire school to teach trainees the best way to fight Godzilla, including lessons on the amount of time between his dorsal spines lighting up and his atomic ray being unleashed. All of this shows just how far Japan has come in their fight against Godzilla and the knowledge they’re accumulated on him. My only complaint is that the characters they show that will end up being the pilots are pretty big douchebags. The commander is a stickler for the rules and seems to go out of his way to terrorize other people. His second-in-command is an American woman, who wastes no time demonstrating her martial arts abilities (something that I’m sure will come in very handy against the 100-meter tall fire-breathing lizard). And then there’s our main character Aoki (Masahiro Takashima), a bumbling idiot who is a bit too obsessed with Pteranodons and Pterodactyls, too the point that it gets in the way of his job of being Garuda’s mechanic and working as a MechaGodzilla pilot. While this is going on, a group of research scientists head to a remote island in the Bering Sea. On a rocky cliff side they find two large eggs, one that looks like it was opened from the inside and another unopened and supposedly intact. As they examine the unopened egg and strap it into their helicopter to return to Japan, the egg starts glowing red and the wind on the island starts to pick up. The scientists quickly find out the cause of the wind – Rodan. Like most of the other monster scenes in this movie, I adore Rodan’s introduction here, starting out on a long shot of the set where you can barely see Rodan in the background until he finally arrives on a large rock pillar overlooking the scientists’ camp. The whole time the scene remains silent, except for the sound of Rodan’s wings. But once Rodan gets on his perch, his theme music starts playing very slowly, just enough to send shivers down my spine every time. As soon as he lets out his roar and unleashes his attack, then his theme song goes to work, Ifukube providing the perfect match to Rodan’s speed and strength. I would also like to take a moment to talk about Rodan in general. To be honest, I was never a big fan of Rodan. I really liked his design with the red/brown color scheme and spikes on the chest of a giant pterodactyl, but Rodan’s character in the Godzilla films always made him seem like a coward. In “Destory All Monsters,” after getting blasted with one of King Ghidorah’s gravity beams, he flies away. Rodan is the only monster to retreat during that battle, which really painted my picture of Rodan as a scaredy-cat. He was alright in “Ghidrah, the Three-Headed Monster” but seemed like the odd-one out compared to Godzilla and Mothra. Same with his other appearance in the Showa series, “Invasion of Astro-Monster.” I didn’t hate Rodan’s appearances in the Showa series, but it really came across like the filmmakers didn’t know what to do with him. But this version of Rodan? He’s swift, pretty cunning for a giant monster, and isn’t afraid to take on any threat despite how powerful they might be. I’m not afraid to admit this is my favorite incarnation of Rodan. There’s just one little problem with this scene, as well as with the rest of the film – in the English dub, they call him “Radon” instead of Rodan. I know that’s his Japanese name, but this isn’t the Japanese version of the film. He has an English name, so call him by that name! So just as things are looking bad for the scientists, since Rodan has forced them to a precipice over the ocean, the ocean lights up and a familiar blast of blue energy shoots out of the ocean towards Rodan. The scientists point out the obvious and Godzilla rises out of the ocean to do battle with Rodan. This battle is spectacular. The shot that convinced me of this is later on that reveals how much smaller Rodan is than Godzilla, where the mutated pterodactyl looks like he’s about a fifth of Godzilla’s size. And yet Rodan dominates most of this fight by finding different ways to combat Godzilla. He attacks him from behind, he slashes Godzilla’s ankles and supersonic speeds and even forces him into a giant pile of rocks. This Rodan is one of the few Heisei monsters that doesn’t have any energy attacks, so it’s amazing to see a fight where the monster has been far more creative with their attacks. Even Godzilla doesn’t use his atomic ray that much, mostly just near the end of the fight, though not before downing Rodan and stomping Rodan until he’s as flat as a pancake. During the battle, the scientists escape in their helicopter with the large egg and Godzilla is victorious, knocking Rodan into a cliff side with his atomic breath, though oddly enough Godzilla seems to chase after the helicopter. I should also note that all this happens within the first fifteen minutes of the movie. “Godzilla vs. MechaGodzilla II” wastes no time getting straight to the reason we’re watching this movie. The scientists take the egg back to their institute in Kyoto to study it, believing that it is a pteranodon egg, since it came from the same nest as Rodan’s egg. After hearing about it on the news, Aoki immediately ditches all of his responsibilities at G-Force and drives to Kyoto to see a real pteranodon egg, much to the irritation of the lead researcher Azusa (Ryoko Sano) and the audience. It doesn’t get any easier when he starts hitting on her. Aoki gets his hands on a plant-like sample that came from the egg and who should come across Aoki and the sample but our dear friend Miki Saegusa. She says that she picks up strange vibes from the sample and takes it to the “psychic institute” so that about a dozen kids can put their hands around it and see if they can feel anything. Sure Miki, you keep telling yourself that you can talk to plants. First “Godzilla vs. Biollante” and now this. Anyway, the institute can make a recording of what the kids picked up from the plant sample and play for the scientists to hear, noting that it sounds like a very odd piece of music. But apparently they put this music at its maximum volume because the egg hears the music and starts hatching. But instead of a baby pteranodon, a baby Godzilla comes out instead. While the scientists are initially scared about a baby Godzilla inside their lab, they quickly learn it is a friendly plant-eating dinosaur that thinks Azusa is his mother, since she was the first person he saw. But just as everyone is celebrating this new creature, Miki senses that Godzilla has made landfall in Japan and is rampaging throughout the country. This immediately gets the attention of the G-Force as they scramble to launch MechaGodzilla. The Captain waits for every pilot to show up, noting that Aoki is missing, since he’s still in Kyoto goofing off. They get a new back-up pilot and this leads to about a five-minute launching sequence of MechaGodzilla. Yeah, good hustle out there guys, Godzilla’s probably destroyed two major cities at this point. 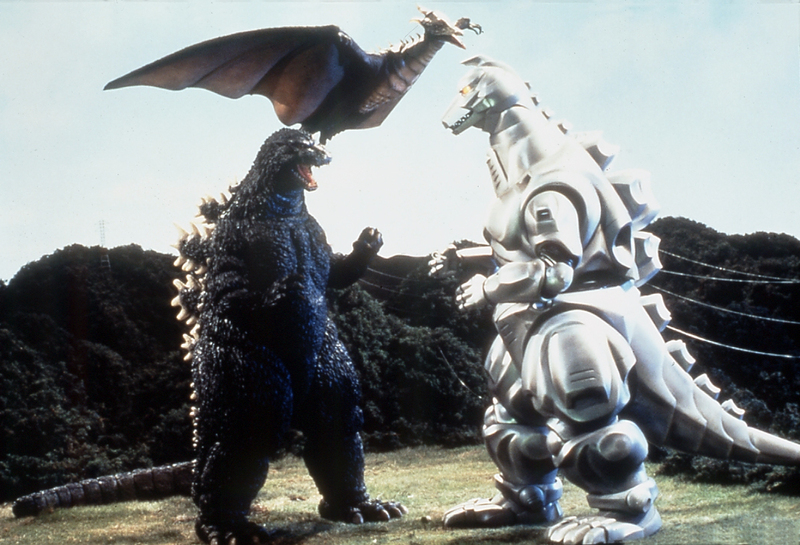 And so we come to our first confrontation between Godzilla and MechaGodzilla. I have to admit that they suit acting for Godzilla and the props they use to show Godzilla’s facial expressions is wonderful here, since we get a full range of emotions from Godzilla reacting to a monster that looks exactly like him, from confusion to rage to dominating. 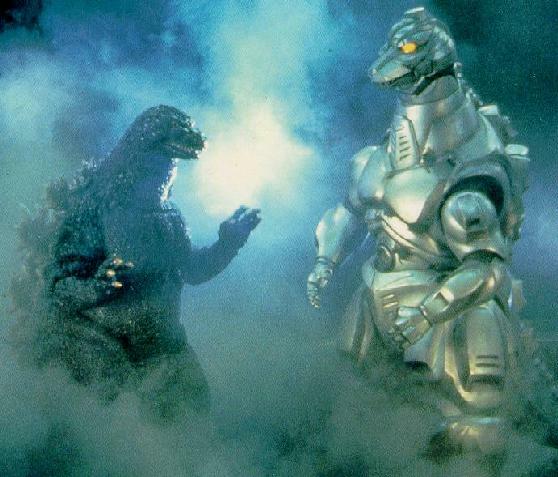 The fight itself is exactly the kind of stuff I love from a battle between these two – MechaGodzilla easily overpowering Godzilla with his vast range of beams and weapons and Godzilla not being able to do much in response. My favorite part is when Godzilla finally uses his atomic ray, is shocked to see it did nothing to MechaGodzilla and then gets blasted with the Plasma Grenade, going down in just one shot. Unfortunately, the pilots get a little bit cocky and forget about Godzilla’s nuclear pulse, which sends their final attack of shocking Godzilla with an anchor right back at them and shutting down MechaGodzilla. Godzilla gives MechaGodzilla one last big body slam for good measure and walks away to continue his rampage. After a pointless fight between Godzilla and military, we learn why Godzilla suddenly showed up now – he’s on his way to Kyoto to get the baby Godzilla. The scientist hide the baby in the basement of their building but Godzilla just starts tearing the building down. In an attempt to calm the baby down, he apparently tells Godzilla through their telepathic link to leave him alone…which Godzilla does so reluctantly. Again, I have to applaud the suit acting here because it really does come across like Godzilla doesn’t want to leave the baby here, especially after everything he went through to get here, and is sad to leave the only other member of his race with these people. After that, there’s a bit of down time where a few key things happen. Aoki is fired from the G-Force but is given a second chance when he suggests combining Garuda with MechaGodzilla to form a more powerful machine. The G-Force takes in Azusa and the baby Godzilla so they can study its biology in the hopes to learn more about Godzilla. And finally, after a chorus of little children sing the same song that woke up the baby Godzilla from its egg, Rodan apparently hears the song and is not only revitalized but is given a power-up, turning from Rodan to Fire Rodan and makes his way towards Japan. The G-Force studies the baby Godzilla and learns that it has a large cluster of nerves at the base of its tail, acting almost like a second brain. They assume that Godzilla must have this as well and create a new weapon to take advantage of this – The G-Crusher. Once they destroy that nerve cluster, Godzilla will not even be able to stand up. They also plan to use the baby Godzilla to lure Godzilla into the open and conduct their next attack on a deserted island. Of course, Miki makes a complaint against this plan, saying that it is too horrible to use on Godzilla. This leads to the funniest part of the movie when the leaders of the G-Force say that they’re not only moving forward with the G-Crusher plan, but they want Miki to be the one to pull the trigger. Her psychic powers will make finding the second brain much easier and she is ordered to go onboard MechaGodzilla the next time Godzilla emerges. Any movie where someone with authority gives Miki Saegusa a smack down and tells her what to do is great in my book. But just as the helicopter takes the baby Godzilla and Azusa to the island, it is attacked by Fire Rodan. The chopper is destroyed and Rodan takes the container with the baby and Azusa away. This leads to Fire Rodan’s rampage through a major city (even stopping by Japan’s Disneyland for a moment), and it is a nice attack, especially with Ifukube’s heart-pounding music and the massive shadows Rodan casts over the city. The scientists speculate that since the baby Godzilla and Rodan came from the same nest, that they have a deep connection to each other. 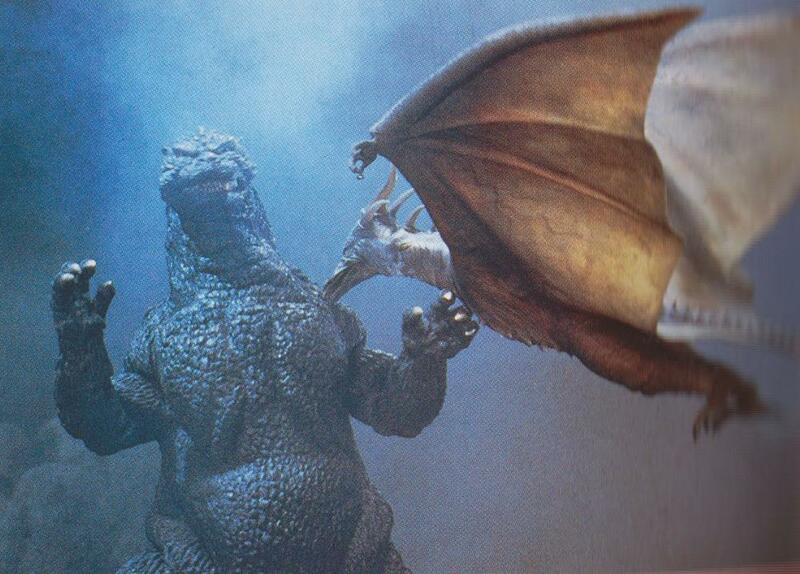 Anytime the baby Godzilla’s eyes glow red, either Godzilla or Rodan have responded by coming to the baby’s rescue. They’re not attacking just for the sake of attacking, but to protect the baby Godzilla. The G-Force responds to this by sending out MechaGodzilla and Garuda to combat Fire Rodan, figuring that Godzilla will probably be here soon as well. While the G-Force assigns an experienced pilot to Garuda, Aoki decides to be a jackass and hijacks piloting duties for Garuda because “it was his idea.” Our hero, ladies and gentlemen. As the day turns to night, Rodan lands in a metropolitan area and starts to open the crate holding Azusa and the baby just as MechaGodzilla and Garuda show up. We learn that Rodan’s transformation granted him an energy-based attack, which I don’t have a problem with since Rodan still prefers to attack his enemies head-on. 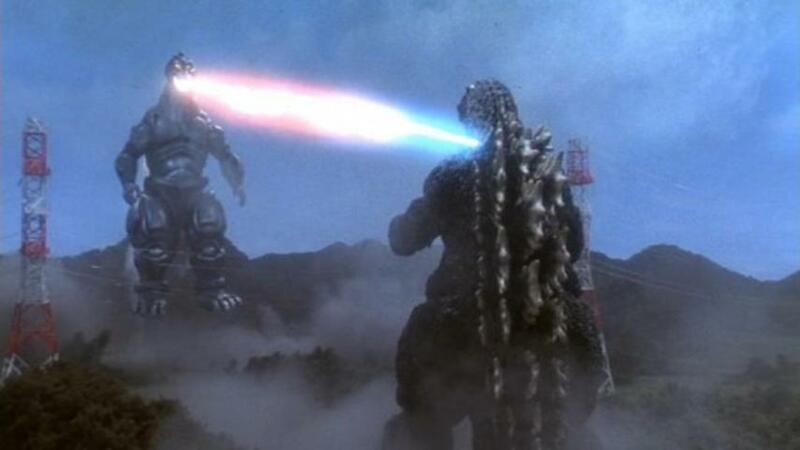 The only reason they gave him a beam is so MechaGodzilla could absorb it to power the Plasma Grenade. This leads to a brief aerial fight between Fire Rodan and Garuda, which ends after Rodan rams Garuda and causes it to crash. 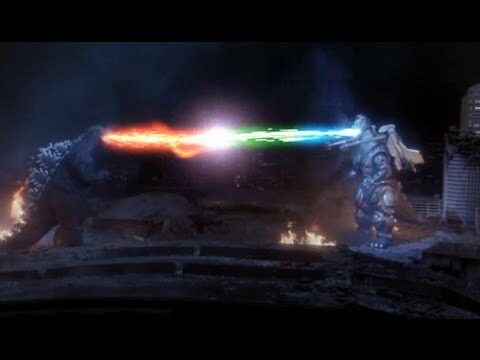 After that we get a pretty damn good battle between Rodan and MechaGodzilla that is one of the more brutal Heisei fights. Like his earlier fight with Godzilla, Rodan puts up one hell of a fight, and it works for a while since MechaGodzilla was designed to fight Godzilla and not him. Rodan is able to damage some of MechaGodzilla’s systems with his beak and direct attacks, including knocking out his eye lasers, and actually takes several blasts from the Plasma Grenade before getting a giant hole blasted in his chest. Of course, just as soon as Fire Rodan is defeated, Godzilla shows up to continue the fight. Suddenly, the mood takes a drastic change as the pilots are convinced that this will be the battle where humans finally overcome Godzilla. The problem is that MechaGodzilla is weakened due to their fight with Rodan and Garuda is out of commission. 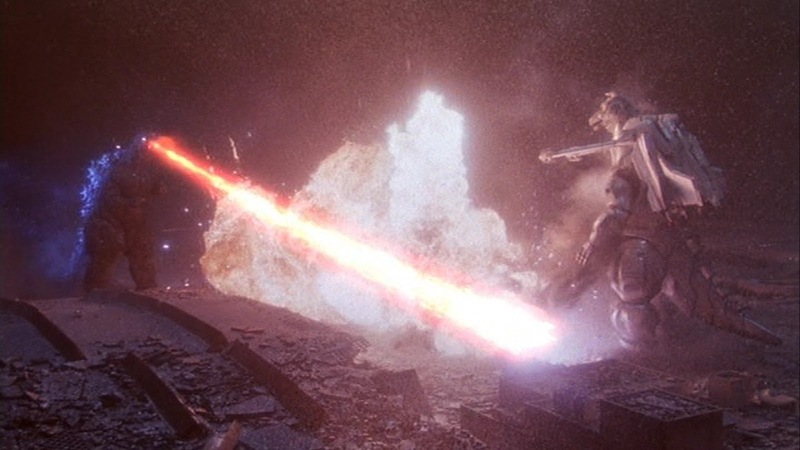 This leads to a fight that pretty much exemplifies the Heisei series, as Godzilla and MechaGodzilla engage in a beam war, where their energy weapons clash in mid-air and cause an explosion of sparks that knocks them both to the ground. The fight does get better once MechaGodzilla is incapacitated and Godzilla starts throwing him around like a rag doll. Aoki is finally able to get Garuda running again and launches it to fight Godzilla. After a brief struggle where Godzilla gets knocked down, that gives them enough time to link up the two machines to form their ultimate weapon, Super MechaGodzilla, with Garuda acting as a jet-pack for the already stacked robot. We get another beat down from Super MechaGodzilla, unleashing all of their combine weapons until Godzilla is down long enough for Miki to locate Godzilla’s second brain. While she hesitates, she does target the brain and they unleash the G-Crusher, destroying Godzilla’s nerve cluster and paralyzing him. After a few more blasts of Super MechaGodzilla’s attacks, they succeed and kill Godzilla. I’m not kidding. According to reports from Toho about this scene and a shot later that shows a motionless Godzilla, the G-Force is successful in killing Godzilla here. It’s not too often you see humans overcoming Godzilla through sheer force and firepower but this is a pleasant change of pace. But of course, you cannot finish off Godzilla like this. Which leads us to the best part of the movie, as the baby Godzilla can sense that Godzilla is in trouble and breaks through the container and roars as loud as he can. This roar doesn’t do anything for Godzilla, but it does awaken Rodan once again. With the little energy he has left, he gets up to help out in the fight. Super MechaGodzilla sees that Rodan is still alive and blasts him, forcing Rodan to land on top of the dead Godzilla. With no other options left to them, Rodan sacrifices his life energy and transfers it into Godzilla. This sequence gets me every time. Maybe it’s because of Ifukube’s wonderfully emotional music, or maybe it’s the way Rodan slowly dies, his body glowing like the last few ashes in a fire. But the main reason is that it serves as a perfect cap to Rodan’s character in this film, giving up everything to save the only other life he cared about. Rodan’s energy revives Godzilla’s second brain and causes a massive storm of radiation, as Godzilla rises back to his feet and roars in triumph. The Godzilla theme music starts up and we see that the storm has caused MechaGodzilla’s armor to start melting. Then Godzilla shows off his newest weapon after gaining Rodan’s energy, the Hyper-Spiral Beam. Anything this beam touches is engulfed in massive flames and explosions. While this maybe an incredibly stupid scene, I love every second of it. The way Godzilla is brought back to life, the heroic sacrifice from Rodan, the music, and the effects work on Godzilla’s beam are all wonderful here. When I think of how awesome and badass Godzilla can be, this finale is one of the first scenes that comes to mind. With Super MechaGodzilla being weakened by the storm and his new power boost, Godzilla is successful in destroying the robot just as the pilots escape. Godzilla finally makes it to the baby Godzilla, who is at first reluctant to go with Godzilla, but after hearing more of the psychic kids singing is convinced to leave the humans and go be with one of his kind. Godzilla and the baby head back out into the ocean and we get some parting words from our heroes about the constant fight for survival or some nonsense. 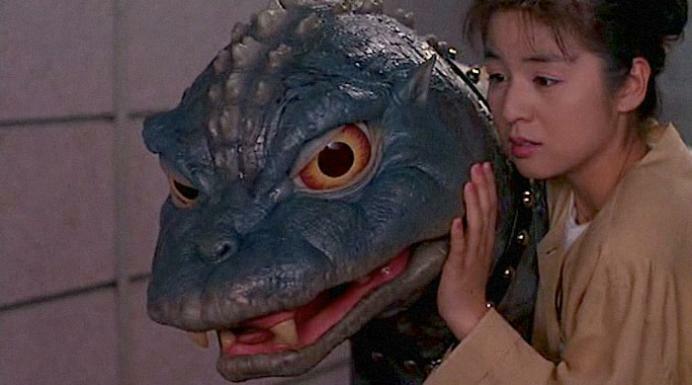 “Godzilla vs. MechaGodzilla II” knows exactly what it wants to be – a very dumb popcorn action flick. It gives the audience exactly what it came for, not wasting any time to jump right into the action sequences and building the story around those scenes. The fights are some of the best of the entire Heisei series and the music provides some great emotional punches to accompany the action throughout. It should also be pointed out that this is one of the few Godzilla films where it doesn’t feel like there’s one true villain. Godzilla and Rodan do everything in this film out of protecting the baby Godzilla, while the G-Force is doing their job by protecting the world from the dangerous giant monsters. While some of the characters are douchebags or idiots, they do make it clear their mission is also protection. In the end, everyone in this film is just trying to save their species. The story is nothing special and feels dumbed down on purpose to make people crave the action scenes even more. And while there are a plethora of stupid and eye-rolling moments, I loved just about every one of them, especially those involving Godzilla and Rodan. It is filled to the brim with Heisei clichés, including beam wars, and sometimes laughable special effects, but they don’t bother me in this movie. I have so much fun with “Godzilla vs. MechaGodzilla II” every time I watch it. As a kid, this was my favorite Godzilla film. The ending is mostly the reason for this, with Rodan’s sacrifice and Godzilla’s triumphant return feeling so grand and badass. But I can admit this still isn’t a great movie, which is why it is my guilty pleasure Godzilla movie.